This Cuisinart SmartStick Hand Blender is designed to handle a variety of basic tasks, such as blending, mixing, chopping, grinding, whipping, pureeing – even processing bread crumbs – to give you time for more creative culinary undertakings! Elegant brushed stainless steel houses a powerful motor, and the handy “stick” design lets you blend in a pot, bowl or pitcher. Operation is easy and cleanup is quick. 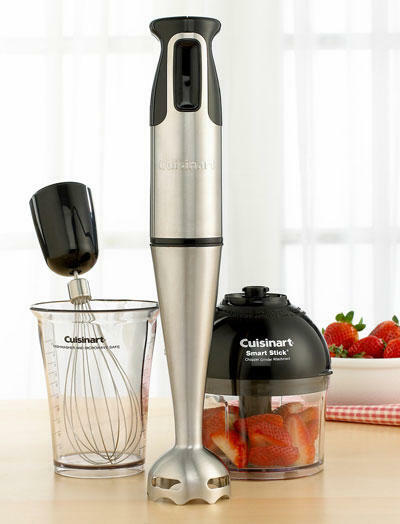 Cuisinart makes it quick, clean and easy to blend, prep and whip a variety of ingredients. The SmartStick Hand Blender includes Whisk and Chopper attachments to extend this blender’s performance. You can blend or whip right in the bowl, pitcher or pot, to eliminate extra dishes, and with the Chopper attached, it turns into a handy mini food prep tool. The look is commercial, the performance is professional, and the ease of use is pure Cuisinart! Use the whisk attachment for beating heavy cream or egg whites. It may also be used to whisk eggs when making scrambled eggs or fluffy omelets. 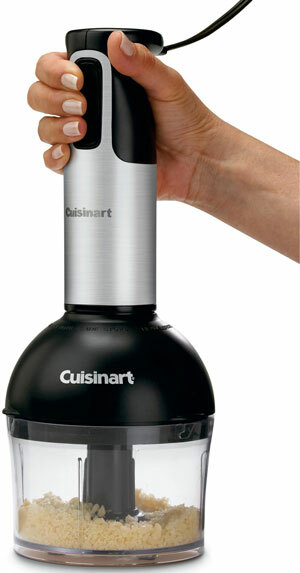 The Cuisinart SmartStick Hand Blender chopper/grinder attachment is equipped with a reversible blade. This blade is sharp on one side and blunt on the other. The blade is attached to a plastic ring which slides over the blade assembly shaft, so it can be easily turned over to select the appropriate blade. The specially designed blade is for mixing and stirring all kinds of foods, including salad dressings, powdered drink products, and sauces. It is ideal for combining dry ingredients, and can be used to emulsify mayonnaise, too. This blade mixes and stirs while adding only a minimum of air to your mixture. A gentle up-and-down motion is all you need to make the most flavorful, full-bodied liquid recipes. Be careful never to remove the Cuisinart SmartStick Hand Blender from the liquid while in operation. • One Touch On-Off Button: Allows you to activate the hand blender at the touch of a button. Simply press and hold down on the toggle switch to blend or pulse. Once the button is released, blending will stop. • Comfort Handle: The handle allows you to control the hand blender with ease. • Detachable Shaft: By pressing the release button on the back of the unit, the shaft will detach for easy cleaning. • Blending Attachment with Stainless Steel Blade and Blade Guard: This attachment easily snaps into the motor body housing. The stainless blade is partially covered by a stainless housing that keeps splashing to a minimum. • Whisk Attachment: Whisk attachment snaps into the motor body housing. This attachment is great for whipping cream, egg whites and other delectable treats. • Chopper/Grinder Attachment: Chop, mince and grind with the Cuisinart Chopper/Grinder attachment. Chopper/Grinder attaches to the blender motor body in place of the blender shaft or whisk attachment. • Mixing Beaker: 2-cup mixing beaker is microwave- and dishwasher safe. Use this container to blend drinks, shakes, salad dressings and more. Designed for easy gripping and drip-free pouring. Cleaning your Stick Blender is easy! To simplify cleaning, rinse the prep bowl, cover and blade immediately after use, so that food won’t dry onto them. If you have a dishwasher, you can wash the prep bowl blade assembly on the upper shelf. Insert the Prep Bowl upside down. Put the blade in the cutlery basket. When cycle is completed, unload the dishwasher carefully to avoid contact with the sharp blade. Wipe the motor body and top of the cover with a damp sponge or cloth. Dry it immediately. Excellent Warranty Service I have had this blender for about a year and have used it weekly for smoothies with great success. Last week I was using it to chop basil and the blade in the chopping bowl sliced into the side of the plastic bowl. Miraculously I kept and located the manual that said it had a 3 year warranty. I called the number, which told me to call another number, I was on hold a very short time. I read the customer service representative my item’s serial number and she sent me a new bowl and suggested that she also include a new blade in case my blade had been damaged. Way to go cuisinart.